The proliferation of plate armor across Medieval Europe was shadowed by the development of crushing weapons like the war hammer. Since swords were virtually useless against plate armor, mounted knights used short hammers, axes and maces to defeat an opponent's improved protection. Each piece is fully functional and battle ready. Although these weapons were banned from the tournament field in the middle ages, some groups still use them for live steel/re-enactments. They will perform just as well as the originals and extreme care should be taken. 15th century, Swiss weapon could devastate armored knights. 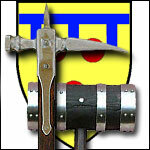 The Lucerne War Hammer combined a lethal thrusting point with an armor piercing back fluke. Our hand-crafted SCA War Hammer is the real thing! The overall length is about 29". The blackened iron hammer head and spike with hand wrought nails on a blackened and seared wood handle is menacing. Solid Steel, Hand Forged War Hammer. Comes with a twisted wire wrapped grip with two steel guards and twisted steel handle. Solid Steel, Forged Two Hand War Hammer. Comes with a twisted wire wrapped grip with two steel guards, twisted and studded steel handle. Solid Steel Spiked, Hand Forged Two Hand War Hammer. Comes with a hardwood shaft and spiked buttcap. Solid Steel, Hand Forged War Hammer. Comes with a leather and wire wrapped grip with two steel guards. Wooden War Mallet with steel reinforcements. Comes with a 43" long wooden shaft. Solid Steel, Hand Forged War Hammer Head. Comes with a hardwood handle. Solid Steel, Hand Forged War Hammer. Comes with a leather wrapped grip with two steel ornate guards and twisted steel handle.